High tide came this morning around the time I took the following photos. It combined with a brisk wind to create intricate waves, some reflecting perhaps the anguish, even anger, some of us have felt over the events of the past few days in Paris. The two photos below were taken within a fraction of a second of each other. I converted the first one to monochrome. Let me know which one you prefer. 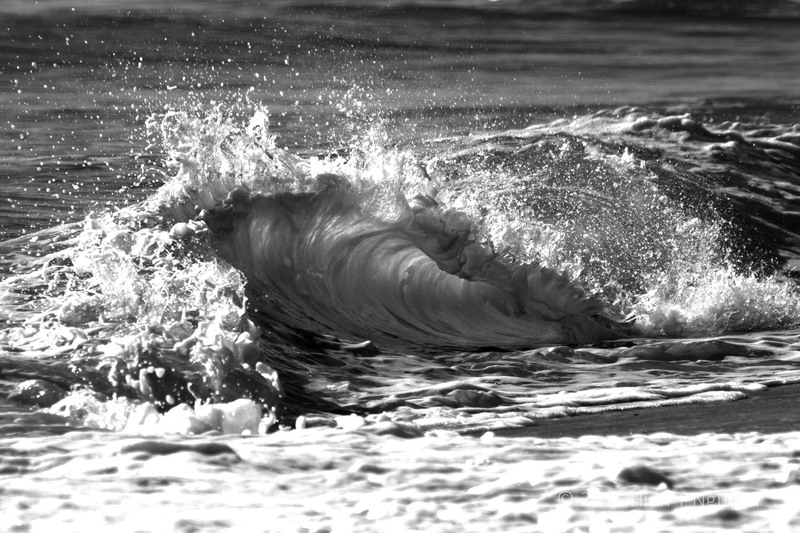 Closeup of wave, monochrome version. 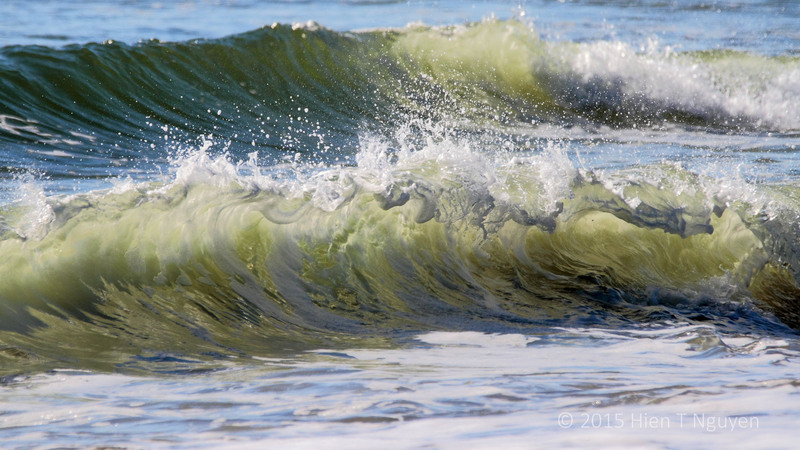 Closeup of wave, color version. Going with the color, Hien. Reminds me of Chihuly glass–gorgeous! Now that you mention Dale Chihuly, there is some resemblance there. Thanks Lois! Nice photo, Hien! I prefer the colour one. My reason is that there is not enough contrast to add power to the B&W one. The colour one gives me more. I thank you for your feedback, Helen! 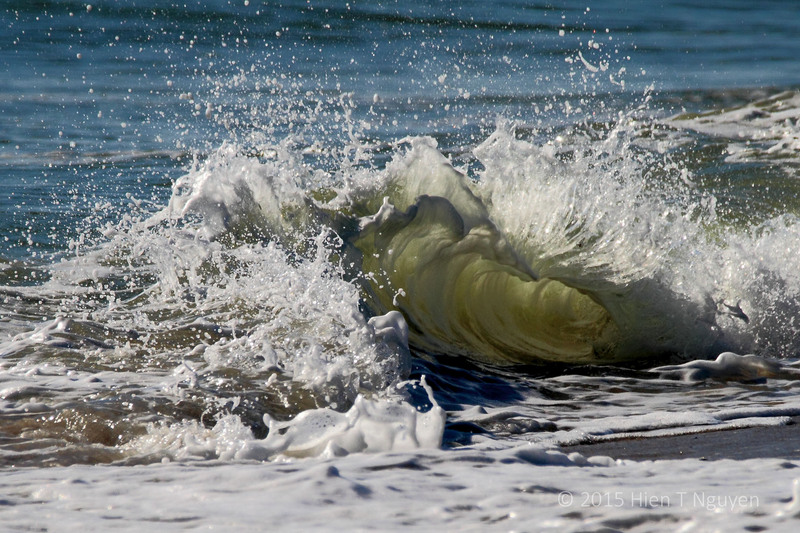 Great timing,Hien,you caught the forceful huge waves just before breaking on the shore!A wonderful post peacefully protesting for the recent tragic events.In the monochromatic one there is more intensity,I like it more.Oftentimes colour distracts our attention. Thank you Doda. I am glad you like these shots and what I tried to convery with them. I think the monochrome really gives a wonderful effect. I think the press ion of anguish and turmoil so well expressed in these. The first picture is just breath catching, nicely done! Of the last two, I like both very well but if I had to pick I’ll go with the color. Flowing water is always mesmerising. I think I prefer the colour one. I appreciate very much your comment and feedback. I really like the first picture the best, too. Between the last two, I like the color one the best. They are all really beautiful. Thank you Katelon, as always. The first picture is the best pictures of waves I have ever seen -and I saw a lot.